Cloud management apps are a new category of programs that are really gaining steam. These apps are made to help users sort through the many cloud services they use to find files they need. People who use these services, which include Dropbox, Google Docs, Microsoft Office Live, Evernote, and more, don’t like spending long hours searching for that one paper or picture they remember saving but can’t remember where they put it. Recently, the app Found has garnered a lot of attention on the Mac for its abilities. Found is a very light and fast app that helps you search through your Mac’s hard drive and various cloud services to find any files you are looking for. When you first launch Found, you will need to login to the cloud services that you want it to look through. After logging in, Found runs through a quick indexing process so it can see what is in these accounts and bring you speedier results. It went through my Dropbox account rather speedily. From here, you can click on the app’s menubar icon (which can be switched from colored to a more traditional Mac theme) or tap the “Control” button twice to bring up the Found sidebar. You’ll be presented with a large search bar at the top of the window, and your connected services just below it. Just type the name of the file you’re looking for, and Found will show you all files with that name, word, or tag in a simple list. It even sorts the files it find by service, name, and type. When you select that file, Found will allow you to get a preview of the document or picture you’re looking at, or listen to the song or video file. The only file type that it didn’t preview for me was a Flash video file I had, but since that is not a common file type on computer hard drives, I wasn’t bothered by it. 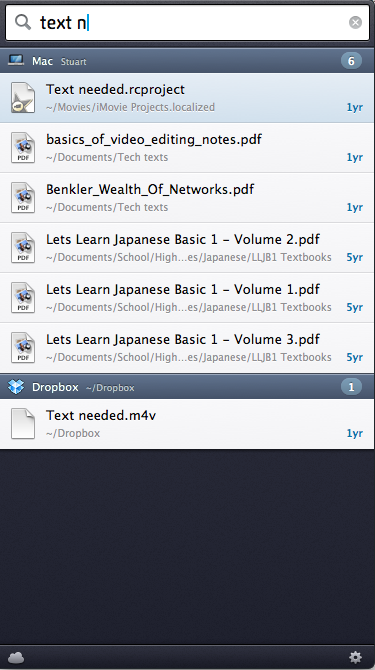 You can either launch a file, or drag and drop the files into other apps like Finder or Mail. And it works when you have another app in full-screen mode as well. Having Found search through your Mac’s hard drive as well as your cloud services is wonderful feature, preventing me from having to switch between Found and Spotlight for searches. Further encouraging this is Found’s ability to launch apps; since Found indexes your Mac’s Application folder, it can launch any app in that folder. The app’s preference interface is great in more ways than one. It’s very straight forward and easy to use, but also provides you the ability to learn about the app. From the preference pane, you can launch the demo video to explain how the app works, as well as access the FAQ’s concerning the security of Found’s connection to the cloud services you use. I do find it misleading that they have a tab called security for this, but no actual security settings. The FAQ does clear up concerns about security, but it would be nice to actually see some form of security settings. Also, the Preference pane at this time does not yet let you set custom folders to search through on your Mac’s hard drive or any of the cloud services. This is a feature that will be included in the future based on the notes, so I await its arrival. Currently the service only works with Dropbox, Google Drive, Gmail, and Google Docs for cloud services, so it could use some expansion. Based off some of the website info, more services will be added soon, such as Evernote and LinkedIn. Found has started off with some great and popular services, and it handles them very well, but I would use this app more once some other services are integrated (Evernote is probably first on my list). Everything considered, Found needs some expansion but has a great start and is something I look forward to be developed further. Found is a free app for OS 10.6.8 and higher (Snow Leopard and later) and is available in the Mac App Store. You can find out more about the app at foundapp.com.